A SPATE of defibrillator thefts in east London and Essex railway stations during April has sparked a police appeal to find the man responsible. 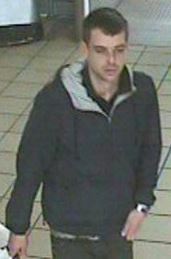 British Transport Police have released a CCTV image of a man believed to be connected to five defibrillator thefts at railway stations including Leytonstone, Woodford and Stratford. On every occasion the man approached the defibrillator cabinet at the station, opened it up and took the defibrillator out. He then either placed it into a bag or under his jacket and left the station. Investigating officer, DC Angie Gates said: “We believe that all five incidents are linked and I am keen to speak to anyone who may hold information or knows the person in the CCTV image, who I am keen to speak to and who I believe has information that could help us. Anyone with any information can contact British Transport Police on 0800 40 50 40 or text 61016 quoting reference 349 10/06/2016. Similar to an incident at Barkingside police station some time ago. Someone broke in and stole all the toilet seats. The police had nothing to go on. Yes, very funny: so presumably he isn't storing them as trophies in in the spare bedroom, he is selling them on, So where is the market?